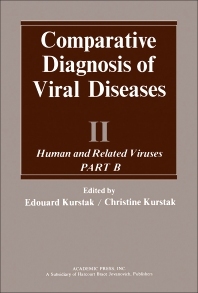 Comparative Diagnosis of Viral Diseases, II: Human and Related Viruses Part B, is devoted to the diagnosis of viral diseases, and is based on the new comparative unifying concept of the viral world. The work demonstrates that the comparison of and the discrimination among viruses, according to the criteria of classification of the International Committee on Taxonomy of Viruses and to the diseases caused by these viruses irrespective of the species involved, are essential for their diagnosis and prevention. The book is organized into five parts. Part I contains papers on unclassified viruses while Part II focuses on cancer viruses. Part III examines the role of vaccines and chemotherapy in the control of viral diseases. Part IV discusses the development of the development of the WHO reporting system on virus diseases. Part V deals with viral diagnostic reagents and newer diagnostic methods. This book will interest all clinical virologists and immunologists and veterinarians and research workers. It is addressed particularly to the professionals of public health and veterinary sciences who work in the area of diagnosis and control of viral diseases and to those who are interested in the problem of the relation between viruses and cancer.